Ever feel the need for speed in a hovercraft that can paint anything underneath or in front of it? 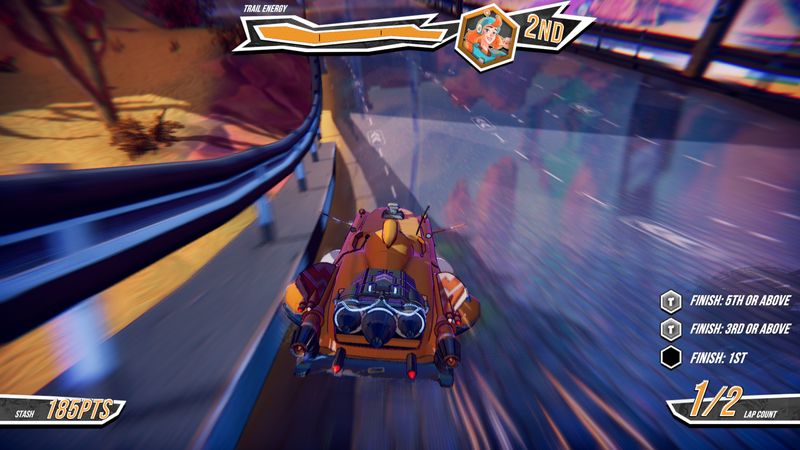 Well even if you haven’t, developer Supergonk has made this very specific dream a reality with their new arcade co-op racing game, Trailblazers. We’ve rolled with this game for a bit now, and have our review revving up for your attention below. Racing is all about finding the ideal line throughout a course. But tracks are generally a static thing, something to be mastered as opposed to altered. Trailblazers flips this notion on its head, and allows racers to paint tracks as they roll over them. Holding the X button lays down paint for as long as the button is pressed, from a limited supply which replenishes when not in use. Pressing the Triangle button when a car is full of paint will launch all of the paint in a straight line in front of the vehicle, spinning out any car on a different team in the process. Anywhere that a color remains on the track will afford boosts to players on that same team. It’s simple, but can result in some unique tactics as while inside corners are usually fought over, outside lines can provide more ground to cover with paint, and thus, potentially higher boosting times. Boosting is all well and good, but it isn’t the only thing that can make or break a team. Players are awarded points based on how often they boost, how much paint they lay down, but also how frequently they can combo these actions together. Since all players can paint over each other’s marks, the strategy becomes being the last one to mark a key spot on the track one lap, and then being able to get the maximum amount of boost out of those sections on the following lap. Since an overall team score is calculated at the end of each race, players have to work together in order to achieve a high total score. The Unity Engine drives the paint-flinging action in Trailblazers. This mostly gets the job done in keeping the action running smoothly. The frame rate stays in the upper ranges for most races, dipping only in particularly involved sections of some courses, or when a ton of paint is being spread around. It’s not so bad as to make the game unplayable, but may irritate some gamers. Stylistically, Trailblazers is a feast for the eyes. Pastel colors help to cement the arcade feeling, as hovercars rip around brightly colored tracks, occasionally splashing down their team colors to dynamically alter the track with what is hopefully a better racing line. Characters include zany creations such as robots, anthropomorphic frogs, and other humanoid species, plus an actual human or two thrown in for good measure. There are ten tracks to choose from in Trailblazers, some of which are inspired from the stories of main characters in the campaign. Indeed, the single-player campaign keeps things interesting, as the story hops from location to location. The dialogue may not be top notch, but an occasional joke here and there ensures that the journey is at least varied in location and scenario. The term “slingshot AI” is thrown around a lot in racing games. It doesn’t apply to Trailblazers. Even on easy, the computer-controlled opponents take incredible precision on behalf of players in order to secure a win. Normally, easy mode gives players at least a fighting chance at winning. In Trailblazers, CPU-controlled players take advantage of the slightest mistake made by other players, and are rarely seen again once they race ahead of the pack. This wouldn’t seem so bad if there was any hope of catching up. But outside of strategically using paint, Trailblazers is a one-trick pony. This is an arcade racer. So it would make sense to see powerups strewn about the track, which can assist racers falling behind, or help those ahead to maintain their lead. Unfortunately, none of that can be found here. Competitors only have their limited supply of paint at their disposal. Trailblazers certainly paints its own trail in the arcade racing genre, something we don’t really see very often. Splitscreen support for up to four players is ambitious as well. An actual story mode with an interesting cast of characters provides a bit of extra, unexpected entertainment, as well. Online may be a ghost town, as with many smaller releases, but couch co-op/competition is where the most fun is sure to be had. A lack of arcade racing features, such as powerups, means that it leans heavily on its paint theme, which may bore some after a bit. But for a quick splitscreen showdown, Trailblazers is easy to get into and not too heavy on the wallet at around $30 USD. Trailblazers review code provided by publisher. Version 1.03 reviewed on a PS4 Pro. For more information on scoring please see our Review Policy here.